itty, bitty wool shorts made from thrifted and felted wool sweaters. i used the little comet tails crescent moon yoga pants pattern ~ it is wonderful! these came out a little bit bigger than i had hoped (this is the size small) but they will fit eventually, right? especially when worn over a cushy cloth diaper. i used the body of the sweaters for the main pieces and the bottom ribbing for the yoga waistband. there wasn't enough wool for the crescent bum panel so i cut that from another thrifted sweater. i still have the stripey sleeves from both sweaters and i am thinking they will make lovely little wool pants. i am gifting these little knickers, but i will most defintely be sewing more! do you have a fun and creative way to re-use felted wool sweaters? spill it! here is what i have for you! this is a miss purl project tote made entirely from recycled materials. the bag's outer is a thrifted cotton sheet that has a nice, crisp linen feel. the lining is an organic cotton gauze - scraps from a mama who sews baby slings. the top of the tote unsnaps and opens up for easy loading and unloading. and there is a cute little pocket inside! this bag is the perfect size to hold a knitting project and notions. the miss purl project tote is just one of the exciting new items i will be stocking in my brand spankin' new etsy shop in the very near future! i am also including this beautiful skein of handpainted single ply merino in a pale rainbow colorway. it is 3.5 ounces and approximately 218 yards. and this adorable vintage holly hobby fat quarter. to win the tote, the yarn, and the vintage fabric simply leave a sweet little comment on this post and make sure i have a way to contact you. * i will choose a winner at random on sunday, may 31st. * i am only able to ship within the US this time. and, if you feel so inclined, please click over to my new shop and add me to your favorites so you won't miss a thing when i start listing items in a couple weeks. if you do so please leave me an additional comment! comments are now closed... and the lucky winner is jerri from many crafts! ThAnK YoU for stopping by to celebrate GiVeAwAy DAY with me!! zig zag, zig zag, zig zag, SERGE! i have been so busy playing that i forgot to share my big mother's day gift with you all. i finally have my very own serger, and it is so much fun, folks! those are my new dining room curtains made from one of my recent thrifted fabric finds. i am totally geeking over this little machine! I LOVE IT!! and i love my sweet and generous husband even more. ThAnK YoU, inspired daddy! we had another big birthday this weekend - this time it was esme's day, she turned six! to celebrate we had a big backyard bash for esme' and harper (since his birthday was just 11 days prior) that included food, friends and a huge amount of FUN! our festivities included pinata, where our normally animal loving children beat a cute little creature with an aluminum bat until it split open and sugary treats rained down from it's broken body. the littles loved it! seriously, i have no idea where he learned to pose like that, but it was darned cute. he stayed this way for several minutes giving all of us all a chance to grab our cameras and shoot! esme' was indeed the princess of the party with her new furry companions, a pretty button necklace made by her friend dejah, and the wool felt crown that mama whipped up the night before. harper got a new crown too! this is the first time that i have bought a cake for esme's birthday. it was such a busy week that i decided that $16.99 for a great big, fancy costco cake was worth it, especially when the payoff was my sanity. harper did not take part in blowing out the candles since he had just had his own cake on his actual birthday. he did, however, eat his fair share of cake. the day ended with sticky, grimy, happy, hyper kiddos. we brought them in, soaked them in the tub, read them a few stories (new dr. seuss books received as gifts!) and tucked them into bed. before :: this sad little blue sweater was destined to be donated. the sleeves were too long, the belt is lost, and one of the belt loops was torn. after :: i added fabric covered buttons, fixed the belt loop and added a new belt, chopped the sleeves and added a cute little trim. so here it is, my new sweater, re-fashioned and ready for cool spring evenings... we might still get a couple of those, right? i also made esme' a new little skirt with an olivia the pig fat quarter that we have been saving for something special. now we need to find a coordinating shirt, perhaps red, or black since white is out of the question for my kids. these fabric covered headbands are so comfy - there are skinny plastic headbands inside each one! now i have the cuteness of a wide headband without the headache! and they are harper approved! while you are here be sure to check out the celebrate summer swap! seasonal celebrations swap #2 SUMMER! it is time for the celebrate summer swap! what is the seasonal celebrations swap? the seasonal celebrations swap is an exchange that incorporates handmade crafts, nature, and family traditions. participating in this swap is a great way to celebrate the beginning of a new season as well as adopting new traditions and ideas into your family. the swap will focus on handmade, seasonal nature table and home decorations. 2. share with your partner your family's tradition to welcome summer- this can be as simple as a summer poem or a summertime craft. or maybe it is a cultural tradition that you would like to share. you could also include photos of your tradition in action or the supplies needed to create your summertime craft. 3. your favorite seasonal recipe. sign up until friday may 29th, and then i will send an e-mail with your recipient's name the following evening. swap packages should be ready and shipped by saturday june 20th, the first weekend of summer! that will give us 3 weeks to work on this project. please feel free to go above and beyond when creating your swap partner's package, but do not skimp- we want everyone to be thrilled when they receive their seasonal celebrations swap package! also, please, please let me know as soon as possible if something comes up and you are unable to fulfill your swap obligation. there is also a seasonal celebrations swap flickr group where we will discuss the swap and share photos, so be sure to go join! there are several photos there from the spring swap to give you some ideas and inspiration. the fabulous thing about this swap is that there will be a brand new one with each new season! i am looking forward to celebrating summer with you all! here i am, modeling my new reversible apron! you might remember, i blogged about it here, and again here. soon after my second apron post it was all cut out and ready to sew. then it sat at the bottom of my sewing caddy for several months... almost 2 years! for the next 4 weeks my girl friends and i are busting stash together. this means no fabric purchases from may 15th- june 15th and we will sew as many things as possible from fabric we already own. i needed this baaaddd!! so far i have finished my emmaline apron, and made 12 coloring wallets - one each for harper and esme' and the rest for gifts. we gifted the lizard wallet to one of esme's classmates today! i also made esme' two reversible (i am really into reversible lately!) smocks. love these! so quick and easy and CuTe!! right now i am off to bust some more stash... fabric covered head bands this time! wanna join me? do you think you are up to the brutal challenge of not making any fabric purchases for 4 weeks? if so leave me a comment - i would love to see photos of your stash busting creations! oh, and i will be posting details about the seasonal celebrations summer swap tomorrow, so please stop by for a visit and sign up! as tony and i were leaving the bookstore empty handed on mother's day monday i spied a book on one of the shelves and made a smart aleck-y comment about how i should probably buy it. then this afternoon while i was filling my shopping cart with fabric and books at the thrift store (see my tweet over there in the column on the left) what should i come across? that's right, the very same book! (see photo above) secrets of simplicity~ learn to live better with less. it seems the universe is speaking to me and i intend to listen. starting right now i am going to make a serious effort to clear the clutter from my life and live simply and deliberately. it all feels a little de ja vu-ish, as i have had this thrift store book = life lesson experience before. unfortunately i did not find this life changing book before my cart was full. here are the other books i picked up today. some for me, a couple for harper and esme' (lilly's purple plastic purse in hardback! hoo-rah! ), and a few teen novels for niko. and the fabric- that red and white print will be curtains. then there is a green striped wool sweater that will be felted and re purposed. and pretty linen napkins that are destined to become patchwork eye pillows for gifts. that little mouse print knit was just too cute too pass up. i have no idea what i will sew with it. maybe jammies, or undies, or diapers for my expecting girl friends. whatever i make, no doubt it will be shared right here with all of you! ... and my baby boy grew up. today we celebrated harper's 2nd birthday! two years old, he is more boy than baby, for sure. he throws rocks and digs dirt. he loves bugs and worms and he climbs gates! all boy! we took him to build a bear today and he made a puppy. we named him dewey. this evening we ate dinner at mongolian bbq because it is harper's favorite place to eat. rice and tiny tea cups are a big hit with the two year old crowd! at the end of the meal harper's fortune cookie predicted that he "will be surrounded by things of luxury." then we came home and enjoyed carrot cake with cream cheese frosting. happy, happy birthday sweet boy! we are so very lucky to have you in our lives~ bugs, dirt, rocks and all! read harper's birth story here. and his first birthday is here. my husband, being a restaurant manager, was gone all day long yesterday~ mother's day. i received a few sweet texts from him during the day telling me that he loves me, misses me, wished he were home with us. when he did get home after a l-o-n-g and busy day he was exhausted, so we let him rest. the kids and i, however, had a really nice day. we rode bikes, played in the yard, walked to the store, made italian cream sodas, and watched a movie. there were handmade cards and gifts too. a wonderful day indeed! i feel special, deeply loved, appreciated and lucky, lucky, LUCKY for everything i have! the road to get here has been bumpy and unpredictable, but the journey has been worth every single second. lately i have been slacking big time when it comes to reading my favorite blogs. there is just not enough time in a day to do everything i'd like, and well, some things are certainly priority (kids, hubby, home, self) over other things (blogs, knitting needles, sewing machines) . i did try to pop in on everyone and get myself all caught up on the goings on in the blog world this afternoon. i saw photos of adorable kids and amazing crafty creations. i learned that one friend has big, exciting news while another is going through something unimaginably difficult. i was inspired by quilts, gardens, muffins, summer clothes, and uncluttered closets. i was reminded how wonderful each of these blogging friends are! i also sewed a new tote bag for myself. these are very bad photos of a very cute bag! to be perfectly honest i am waaayyy to lazy this evening to take new, proper pictures, so you are stuck with these! perhaps tomorrow in the daylight cute bag and camera will make a connection... so, back to the bag, it is a large tote with a handy little pocket inside and an elastic loop and fabric button closure. it will hold everything i need for a summer day outing- wallet, sunscreen, water bottle, shades, knitting... i am set! and, my blogging friend val from collecting the moments... one at a time gave me this super sweet lemonade stand award! 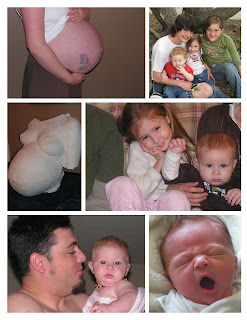 i *met* val on a parenting forum and was continually inspired by her creativity. we were pregnant with our (not so) baby boys around the same time and shared the excitement and joy of growing bellies, homebirth and life with a new wee one in the house. my own little garden has been heavily influenced by the gorgeous backyard oasis val posted photos of and described in her blog posts. THANK YOU for everything, val! 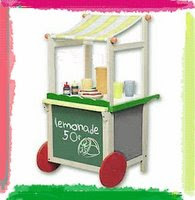 The Lemonade Stand Award is for being a blogger who shows great attitude and gratitude. Cut and paste the award logo and use it in your own blog. Nominate 5 to 10 blogs you feel show great attitude and gratitude. Link back to the person who gave you the award to show your appreciation. 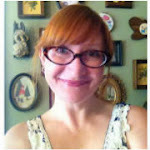 i am nominating the following blogs that inspire me to sew, knit, cook, laugh and enjoy life! oh, and val? can i re-nominate val? because she would totally be on my list had she not nominated me first! i found this sweet little sewing book while thrifting a few weeks ago. LOVE! it is full of wonderful illustrations and more vintage-y inspiration than one could ever ask for. traveling light, anyone? oh, those outfits... fun! ... and do you see her? over there on the left? be still my heart, it is the cutest holly hobbie print! approximately 2 yards! i don't know yet what i will make with my pretty *new* fabric but for the time being it is sewing mama eye candy! yum! just like this photo, i feel a little fuzzy need coffee!! i am excited mom's night out with all of my girlfriends tonight! yay!! wishing you all a happy today!